Drywall mud, also called joint compound, is a gypsum-based paste used to finish drywall joints and corners in new drywall installations. It's also handy for repairing cracks and holes in existing drywall and plaster surfaces. Drywall mud comes in four basic types, and each has its advantages and disadvantages. You may choose one type for your project or use a combination of compounds for the desired results. All-purpose compound is a pre-mixed mud sold in buckets and boxes. It can be used for all phases of drywall finishing—embedding joint tape and filler and finish coats—as well as for texturing and skim-coating. Because it is lightweight and has a slow drying time, it's very easy to work with and is the preferred option for DIYers for coating the first three layers over drywall joints. However, an all-purpose compound is not as strong as other types; namely, topping compound. Topping compound is the ideal mud to use after the first two coats have been applied to a taped drywall joint. It is a low-shrinking compound that goes on smoothly and offers a very strong bond. It is also highly workable. Topping compound typically is sold in dry powder that you mix with water. This is less convenient than premixed compound, but it allows you to mix just as much as you need, and you can save the rest of the dry powder for future use. Topping compound is not recommended for embedding joint tape—the first coat on most drywall joints. When applied properly, a topping compound should reduce your sanding time in comparison to lightweight compounds, like all-purpose. Taping compound is the best option if you need to cover plaster cracks and when superior bonding and crack-resistance are required, such as around door and window openings (which tend to crack due to house settling). It is also the best mud option for laminating drywall panels in multi-layer partitions and ceilings. True to its name, a taping compound is ideal for embedding joint tape for the first phase of finishing drywall joints. Taping compound dries harder and is more difficult to sand than all-purpose and topping compounds. 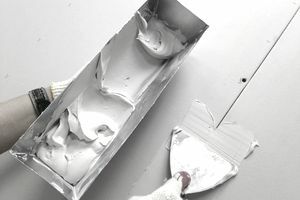 Commonly called "hot mud," quick-setting compound is ideal when you need to finish a job quickly or you want to apply multiple coats on the same day. It is also useful for filling deep cracks and holes in drywall and plaster, where drying time can become an issue. If you are working in an area with high humidity, you might want to use this compound to ensure a proper drywall finish. It sets by chemical reaction, rather than simply drying like other compounds do. This means it will set in damp conditions. Quick-setting mud comes in a dry powder that must be mixed with water and applied immediately. Be sure to follow the manufacturer's recommendations prior to use. It is available with different setting times, ranging from 5 minutes to 90 minutes. "Lightweight" formulas are relatively easy to sand.